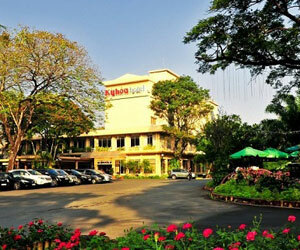 In addition, Ky Hoa Hotel - Ho Chi Minh City is still equipped with a professional restaurant serving Asian-Oriental-European and Vietnamese dishes, conventional center with its seat capacity of exceeding to 600 guess or visitors, 06 tennis court, Rose Café, Dong Ho wedding Center and Rose Restaurant with staffs and officers over 20 years of experience. At The Ky Hoa Hotel - Ho Chi Minh City, all attempts for the purpose of visitor demands and satisfaction. Therefore, hotel will offer such best convenient ways of service and comfortable formality. For this hotel taking rests and pleasure, guests can spend and enjoy their family atmosphere, coffee bar, parking area, car for lease. Its location is at Ky Hoa Tree Plant Garden, Ky Hoa Hotel Ho Chi Minh City with 75 rooms in 3 Star Standard capacity just taking 10 minutes to reach to Ben Thanh Market and 15 minutes to Thong Nhat Palace, Notre Dame Church and 30 minutes to Tan Son Nhat Airport. Room Facilities: Windows, having connecting room for family 3-4 persons, IDD phone call, cable television, air-conditioning, desk, hair-dryer, room amenities, Wi-fi, restroom, bathroom, slippers, minibar. Room Facilities: Windows, living room, IDD phone call, cable television, air-conditioning, hair-dryer, desk, room amenities, wi-fi, restroom, bathroom, slippers, minibar. The Rose Restaurant with its own area about 350m2 to 650 m2, to be designed with its luxurious model, best condition, well-ventilated. This restaurant in conjunction with its banquet hall exceeds to different space to satisfy an option of guests and visitors. The Rose Restaurant with its area of 350m2 – 650m2 is designed with expensive furniture and luxury facility. Diversified design for restaurant will bring a large scale of seat capacity for guest demands with banquet hall and convention center as shown professional mode of service and reception, enthusiastic form style accompanying with delightful media chain integrated to complex system as per requirements and in out of reach of welcomed guests. Dong Ho restaurant is located at 195-197 Cao Thang (noi dai) street, ward 12, district 10, Ho Chi Minh city in the middle of widespread ground in cool place with all green trees over annually, with diversified and elegant design of banquet hall but not less luxury and comfortable. A location of Rose Café is a widespread area, having green trees and water fall. It is a great ideal for enjoying your breathtaking, purity, cool, intimacy place for pleasure time to guests to stand and together riding coffee with friends, family or lunch time with your office and company partners or colleagues daily.